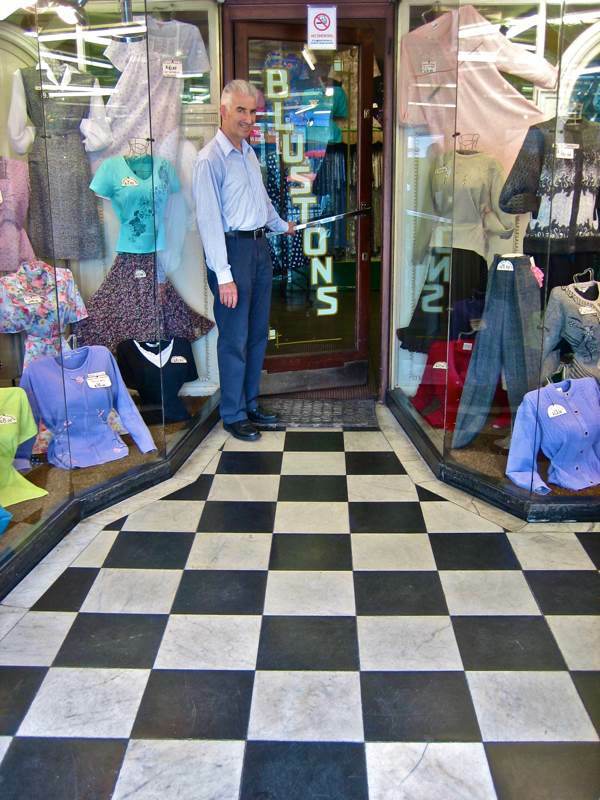 This week, Michael Albert announced the imminent closure of Blustons – so I publish my story today as a tribute and to give my readers the opportunity to make one final visit to purchase a frock as a souvenir of this legend in ladieswear. 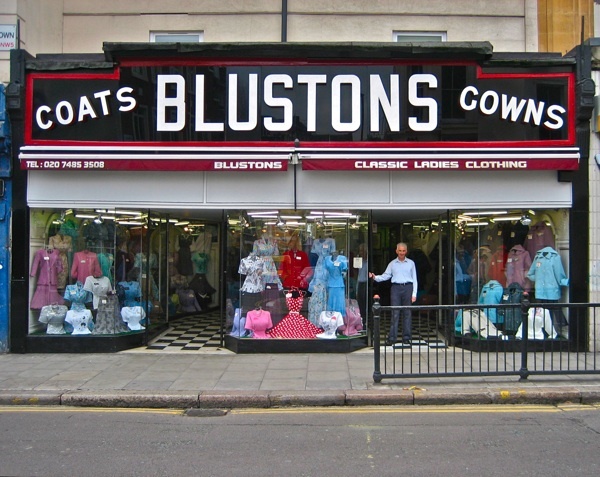 If you are considering a new gown for spring, then this might be your last chance to take a hop, skip and a jump over to Blustons in Kentish Town, and find Michael Albert waiting eagerly to welcome you to the family business founded by his grandparents Samuel & Jane Bluston. 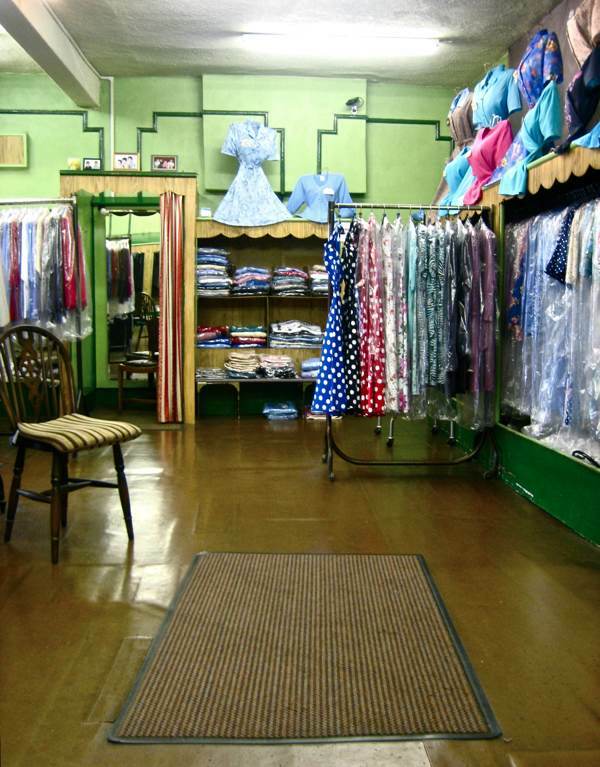 Pictured above in the changing room at the rear of his immaculately preserved eau-de-nil store – standing between portraits of the progenitors of this legend in ladies’ clothing – Michael was the proud custodian of the shrine to the Blustons, whose romance blossomed over sewing machines in an East End clothing factory a century ago. Outside, upon the art deco facade, the heroic name of Blustons was proclaimed to the world in three-dimensional block capitals, flanked by the words “coats” and “gowns,” paying court like flunkeys. A marble checkboarded entrance led you between gleaming windows filled with a magnificent array of clothing, some on mannequins and some suspended upon lines as if floating like kites on the breeze. You seized the chrome handle and pulled, and you were transported into a Shangri-La of green paint and old lino, where the dress styles had remained eternally unchanged. In the fickle and capricious world of fashion, this was the strange magic of Blustons. 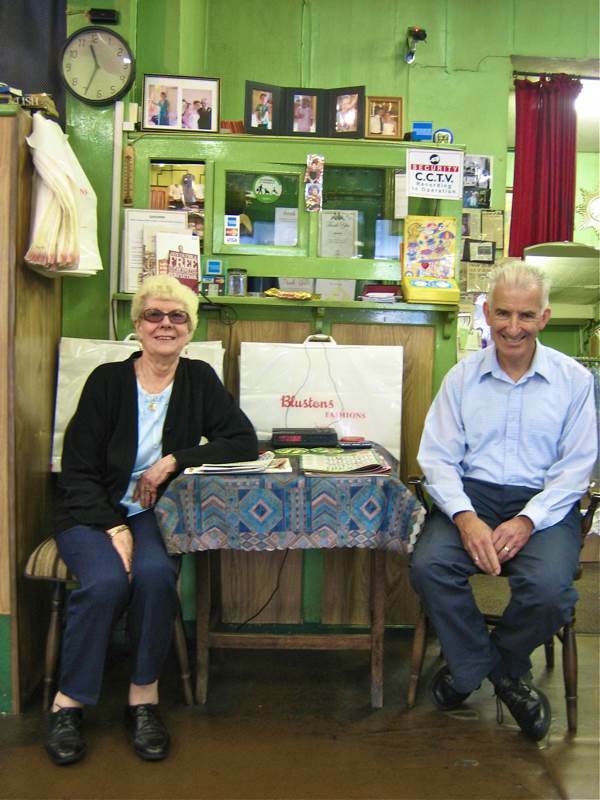 Michael Albert and his colleague Barbara Smith ran the shop with the effortless aplomb of a vaudeville conjurer and his assistant. You selected your desired gown, Barbara lifted it from the rails with a flourish, swept aside the curtain of the cubicle with practised ease, and invited you to step inside. Yet, even though I was a perverse customer who had come not to seek a gown but to discover the story of Blustons, Michael was gracious enough to indulge my fancy. And then, to illustrate the cyclical nature of fashion, Michael produced the current edition of Vogue, leafing through with pride to reveal a photo of a model standing in the entrance of Blustons in a Dior suit, not so different from those on sale. Both he and Barbara exchanged knowing smiles, glowing with pleasure at such an authoritative confirmation of their shared belief that the clothing they sell transcended mere trend. And as I knew my story would not be complete without a word from Barbara, I took this opportunity to ask how she came to be there. Something becomes classic when it cannot be improved upon and this was the nature of Blustons’ dress shop. 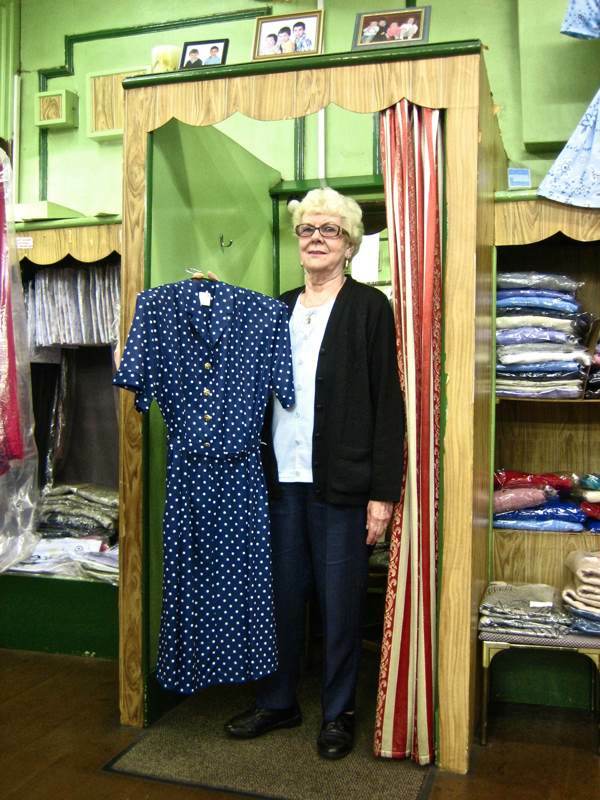 Even though most of the customers were octogenarians and their seniors, the renewed appeal of this clothing for the younger generation brought a whole new clientele. So, as there was no reason to suppose that this cycle should not repeat in perpetuity, I hoped Blustons would go on forever. Yet age creeps upon us all and the time has now come for Michael Albert to retire. 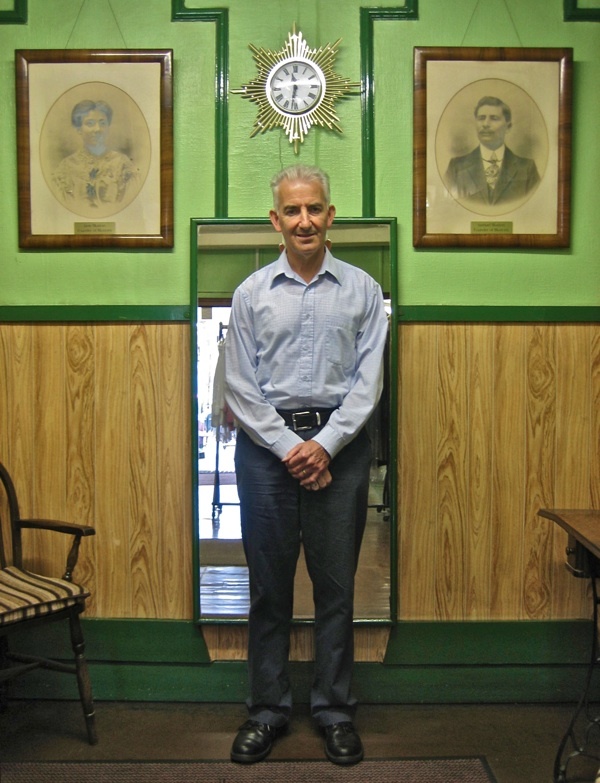 A story that began over a century ago in the East End concludes here. I am sure we all wish Michael well in his retirement but, in my mind, I shall always think of his shop as the eternal Blustons of Kentish Town. Still a shame the past must go, love ones depart, our bodies grow frail. The renewal is good – if it was not so hard to let go of the past. In the 1930′s , my late father Joe Goldstein of Boreham Street used to supply Bluston’s with funeral coats made to measure at very short notice. If my memory serves me rightly it was the custom of the time to employ “Shlappers” whou would stand outside the shop to persuade window shoppers to enter the premises. Good luck to all those who were connected to this landmark of the shmutter trade ! This is a shock though perhaps I am to blame as I have lived in the area for 30 years and never bought anything from Blustons a.k.a the nan shop. I am not in the target age range and never saw a customer going in. The facade is lovely and I hope that stays. It made me feel very sad when I read this news today, this shop has been a “gem” in the midst of the mainstream mediocrity that fills what is left of the high street Kentish Town, I know retirement is the reason given for the sad closure of this well known local landmark store but I am almost certain that a decline in trade will have also played some part, which is why I now echo the comment of Laura Jacobs, as I said in a previous post on local hardware shops as quaint as these places may look they are not museums and if people do not support them in sufficient numbers then one by one they will go, so if you have a valued local independent shop in your area my message to you is USE it or you will LOOSE it, FOREVER. I wonder why some of us are so attached to the past and others don’t give a damn ? A fascinating piece of social history , pity somebody couldn’t take it on as a “vintage ” business. Let’s hope the building remains intact . The shop front should be listed so that it, at least, will survive. It is a very good example of 30s styling and now quite a rarity. Another cornerstone of old London gone. Perhaps some clever entrepreneur could open a cafe or restaurant called Blustons and keep the signage…can you see it? I’m really sorry they will be closing! I passed the shop on the bus frequently during the eight years I lived in Highgate, it’s a real landmark of Kentish Town. I do hope there will be a good future for the premises – it’s unique. I only learned from Marilyn that Michael was retiring. I am a Volunteer at PAH, where l run an Art & Crafts group. Your mother in-law Esther Cohen is keen, talented and regularly partakes in the group. After a century it is so sad to hear you are closing and that the shop cannot be passed on. But we all need to retire and l am delighted you have had such customet support over the years + your recent publicity+ all those wonderful memories. 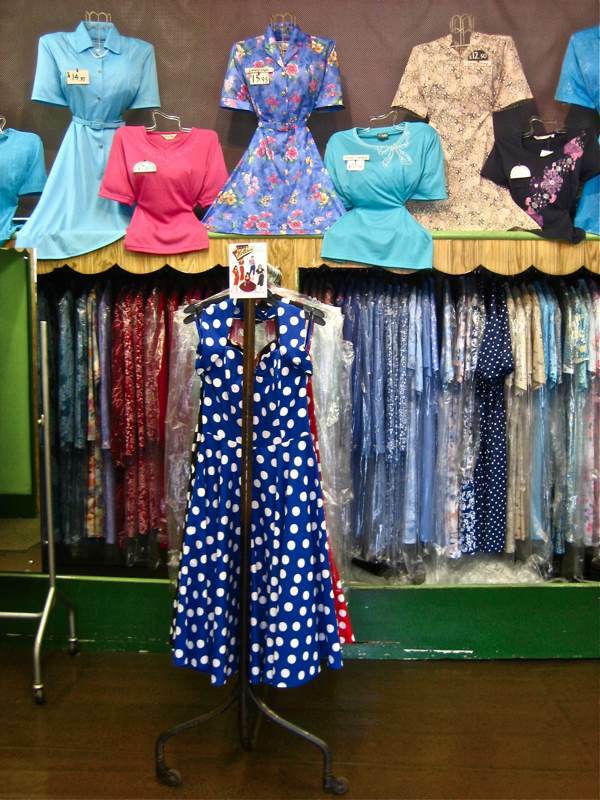 I myself embarked in the fashion business in 1973 as a young College graduate. I have only spent some 35 years in fashion working in both design and buying roles. I loved it! Fashion is in my blood. I lived nearby whilst at university and always loved this shop, especially the window displays with signs pinned to the items: eg “Model Dress” , “Smart Coat” etc. I’m very sad that this shop has closed (I have checked that it was still there now and then, when I have been back in the area and today found I had missed it’s closing by a few days). And it’s poor customers will be left bereft – I don’t think Net A Porter etc or Primark will have much truck with them. With an aging population I can’t see why someone didn’t carry this shop on? And what will become of it. Probably an estate agents. I took a photo of the shop front when I first stumbled upon it, more than twenty years ago. It looked like something from a bygone era then, but Blustons far outlasted almost everything else round about it. Like so many other people, I always looked in the window as I went past, glad that it was still there in a world where so much comes and goes so quickly. I’m glad to say that one December day instead of just passing I took the time to go inside, and bought a sensible cardigan for my eighty-something mother. I believe I still have the Blustons plastic bag somewhere. When I saw the empty shop window, last Sunday, I couldn’t help but take a few pictures. Perhaps like Palmer’s in Parkway, the shop front can be preserved If Camden Town can have their monkeys and talking parrots, why can’t Kentish Town have its coats and gowns? My grandfather was Leon Bluston from London. We do not know anything ofhis ancestors or siblings, though we know his parents came from Poland at the beginning of the 1900′s. We also heard a story that he had several ladies dress shops that he gave as a dowry to his sisters when they got married. He was injured in the second world war during the blitz and moved to Wales and then to Manchester and St. Annes. The name Bluston is very rare, so I am guessing that the owners of the shop are somehow related.